Cleric, educator, community activist, coach. Born at Bavaria, Germany on 2 April 1874, he moved to Pittsburgh, Pennsylvania at a young age, where he received elementary education at St. Mary’s School and entered the Order of St. Mary. He assumed holy orders in 1892 and attended Normal School at Dayton, Ohio. He began teaching at Chicago before moving to Winnipeg in 1893, where he taught at St. Mary’s School (1893-1900), after which he taught at Sorbonne University at Paris, France for two years. He traveled back to North America, teaching one year at Dayton Normal School before teaching at San Francisco, California (1903-1906) and New York City, New York where he was Principal of a school (1906-1908). He relocated to St. Boniface in 1908 where he was Principal of Provencher School / Provencher Collegiate Institute (1909-1935). At the time of the school fire in 1923, he was in Belgium as the St. Boniface delegate to the Society of St. Mary, and he led rebuilding efforts upon his return. 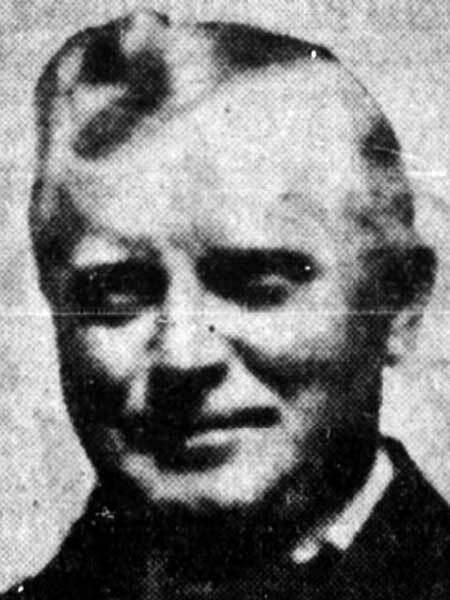 He was a sought public speaker and was President of the Manitoba Educational Association (1932-1933) and the St. Boniface Agricultural Society, Chairman of the St. Boniface Parks Board, an executive member of the Manitoba Teachers’ Federation, and a member of the Knights of Columbus and the St. Boniface Kiwanis Club. He was active in coaching of numerous athletes in the Winnipeg area. On 21 January 1934, on the 25th anniversary of his tenure as School Principal, he was feted to a grand banquet at the Marlborough Hotel attended by many dignitaries and political leaders, where he was given a gold watch with chain. He died at the St. Boniface Hospital on 13 October 1935 and was buried at a cemetery in St. Louis, Missouri. A tribute to his impact on the community, over 4,000 people filled St. Boniface Cathedral to attended his requiem mass. “Bilingual teachers discuss methods,” Manitoba Free Press, 12 November 1909, page 6. “The Provencher School, St. Boniface,” Manitoba Free Press, 24 February 1913, page 3. “Principal of Provencher School speaks vigorously at Union Canadienne Club,” Manitoba Free Press, 29 February 1916, page 8. “Flames destroy St. Boniface's largest school,” Winnipeg Evening Tribune, 4 January 1923, pages 1. “Brother Joseph celebrates 40 years’ teaching,” Winnipeg Tribune, 19 March 1926, page 6. “Many prominent businessmen learnt their sport under the direction of Brother Joseph,” Winnipeg Free Press, 28 November 1931, page 23. “Brother Joseph is feted by people of St. Boniface,” Winnipeg Free Press, 22 January 1934, page 4. “Bro. Joseph, St. Boniface teacher, dies,” Winnipeg Free Press, 14 October 1935, pages 1 & 7. “Brother Joseph, beloved teacher of St. Boniface, dies in hospital, age 61,” Winnipeg Tribune, 14 October 1935, page 3. “Brothers Joseph’s funeral will be held Wednesday,” Winnipeg Free Press, 15 October 1935, page 3. “Mourning city heads Brother Joseph Tribute,” Winnipeg Tribune, 16 October 1935, page 3. Obituary, Winnipeg Free Press, 18 August 2012, page B14.